Rietze 14230, Mercedes-Benz Citaro MVG Lüdenscheid, skala 1:43 ! For local traffic and distribution transports, Ferrero operates this Mercedes-Benz Actros refrigerated box truck with tail lift in the rear. 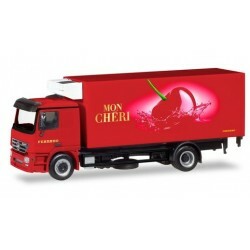 The vehicle is currently overhauled and will feature the new Mon Cheri design.